A Musical Fable of Broadway Based on a story and characters by Damon Runyon. In the neighborhood of Times Square, New York, in 1948, Nathan Detroit is known to have a passion for shooting craps. He cares more for the game of craps than for Adelaide, a star singer of the nightclub, "Hot Box", to whom he has been engaged to for fourteen years. He is impatient to shoot craps. However he cannot find a place for a game as just yesterday Inspector Brannigan tightened the controls on gambling. Although the premises of Builtmore Garage seem suitable, the advance of one thousand dollars required by its owner Joe Builtmore is far too much for Nathan. He is short of money. Nevertheless, his friends pester him to set up a game. Sky Masterson elated with his gain of fifty thousand dollars shows up. Nathan challenges Sky to bet one thousand dollars on whether Sky can bring with him to Havana a girl Nathan designates. Sky sure of his charm easily accepts the bet. Sky could not even suspect that Nathan would choose Sara Brown who works for the Salvation Army and famous for her rigid uprightness. Sky goes with determination to the Salvation Army station, where he sees Sara and Arvide who are disappointed by the poor results of their missions. He makes an offer to bring along a dozen sinners to a meeting of the Army in exchange for her accepting his invitation to dinner. She is too upright to accept such an offer. However, she is surprised that she feels attracted to him, and her keen sense of modesty drives her to give Sky a punch in spite of herself. General Cartwright comes and says that the New York station is to be closed as it has too few followers. Sara pleads for the continuation of the station. However, it seems to have little chance of survival. Sky shows up and guarantees that tomorrow's evangelic meeting will be crowded. Sara at last accepts Sky's offer for the sake of the salvation of the station. Nathan has not yet secured a place for a game. Although he thinks he has practically won the bet, he doubts that the prize money of one thousand dollars will be paid today in time for settling the advance to rent the garage. Inspector Brannigan is sniffing out the spot. Nicely Nicely Johnson invents a pretext that he and his firends are preparing a party to celebrate in advance Adelaide and Nathan's wedding. Now they have to calm down the frustration of Big Joule, a big shot who has come all the way from Chicago to shoot craps. An idea hits Nathan. Sky succeeds in taking Sara to Havana. Her sense of decency annoys him until she has drunk cocktails in the liberal atmosphere of Havana. She changes in character so completely that she provokes a free fight in the cafe. Now that he has won her confidence, he finds her adorable and he is a bit puzzled by this. He is in no mood to further seduce her as she is still under the effect of the cocktails. Sara and Sky, each feeling ill at ease, come back to New York at dawn. The silence filling the streets strikes them and makes them sincere to their thoughts. When they are standing close, a group led by Arvide comes back from an overnight meeting. They join the group and go to the Army station. As they enter the station, they hear sirens and see Nathan and his band rushing out of the station. It seems evident that Nathan has been holding the game in the station taking advantage of the absence of Sara and Arvide. Sara immediately thinks that Sky brought her out as a ruse to help Nathan. She is badly hurt and leaves. Adelaide rejoices to know that Nathan has at last made up his mind to marry her. However, Nathan does not show up at the party announcing their wedding. Although she is furious at being left alone, she cannot really dislike him. Sky tells her that confirmed gamblers are the last men to marry, and, as a matter of fact, he finds himself unsuitable for Sara. Sky decides to leave New York in a bid to forget Sara with whom he has really fallen in love. Before leaving, he attempts to make a bet with Nathan and his band in order to keep his promise to Sara. He absolutely wants to please her, even though it is neck or nothing with him : if Sky wins, Nathan and his band will attend a mass of the Salvation Army, and if Sky loses, he will pay a thousand dollars each. Victory smiles on Sky. Nathan and his band including Big Joule reluctantly go to mass. The gamblers confess one after another, delighting General Cartwright among other officers. Seeing the promise has been carried out, Sky goes away. Nathan tells Sara why he and his band have attended the mass. She realizes that she misunderstood Sky, and that she loves him indeed. Sara runs out into the streets looking for Sky, and comes across Adelaide. They agree to marry the gamblers and transform them. At a corner of the streets same as yesterday, Nathan is selling newspapers. Sara and Sky march in with the Salvation Army band. They have just got married at the station of the Salvation Army. Nathan is to marry Adelaide soon at the station after a period of engagement that has lasted fourteen years. A happy end for the nice guys and dolls. Final performance for Marino Yui, Tamahana Yufu, Marina Mayu, Hyuuga Ran and Gojou Marina. 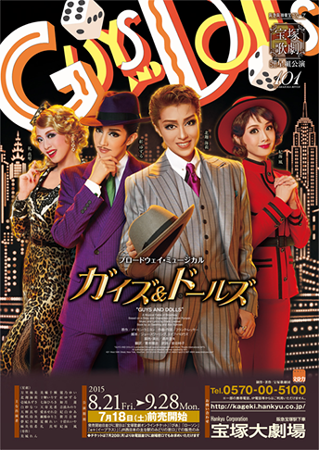 Guys and Dolls was first performed by Moon Troupe in 1984-85, starring Daichi Mao and Kuroki Hitomi. It was performed again by Moon Troupe in 2002, starring Shibuki Jun and Emi Kurara, and Hokushou Kairi performed Nathan Detroit in the shinjin kouen version of the performance. Created by zaraphena. Last Modification: Monday 25 of February, 2019 06:49:38 PST by caithion.